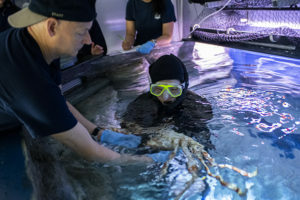 Aquarist Mikiko Williams, clad in a black wetsuit, stood in the Japanese Spider Crab habitat at the Pacific Seas Aquarium, reached down, gently picked up an animal that weighed about 8 pounds and hoisted it up and out of the water. It was just after 8:30 a.m., the Zoo would open in an hour, and there was much work – and crab care – to do. Plus, the crabs were about to star in a research project that could aid their species. Mikiko Williams lifts a giant spider crab out of its pool to fellow aquarist Mark Nayer. Behind the scenes, on the other side of the exhibit space, aquarist Mark Nayer took the crab from Williams, its pincers moving to and fro, and placed it on a scale for weighing. “Watch your sleeve,” Point Defiance Zoo & Aquarium Associate Veterinarian Dr. Kadie Anderson warned veterinary student Hali Jungers as one of the animal’s impossibly long legs reached her way. 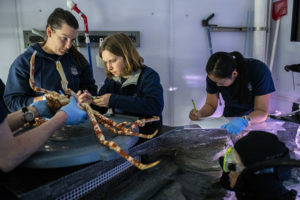 Quickly, Anderson and intern veterinarian Dr. Kat Reed went to work, giving the spider crab a physical inspection, then seeking just the right spot, exactly the right angle, to gently draw a fluid called hemolymph from one of its legs. Intense concentration furrowed Anderson’s brow as she worked. Veterinary technician Julie Lemon kept track of vials of fluid as the procedure was repeated on all four Japanese spider crabs that live in the aquarium. Dr. Kat Reed, right, takes hemolymph from a giant spider crab, assisted by aquarists. The data those vials contain could make a big difference in what scientists know about this fascinating species. Hemolymph is a fluid plasma that circulates through the bodies of arthropods (like crabs) in the same way that blood does in vertebrates. Like blood, it can be tested for a range of infections, heavy metals, proteins and other substances that indicate the health of the animal. It sounds like the obvious sample to take in a physical exam, with one big difference: there’s really not much known about marine crustacean hemolymph. 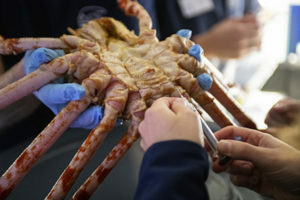 Veterinarians draw hemolymph from a giant Japanese spider crab. Enter Dr. John Griffioen, intern veterinarian at Connecticut’s Mystic Aquarium. As part of his training, he is beginning the first major study of hemolymph parameters in marine crustaceans. 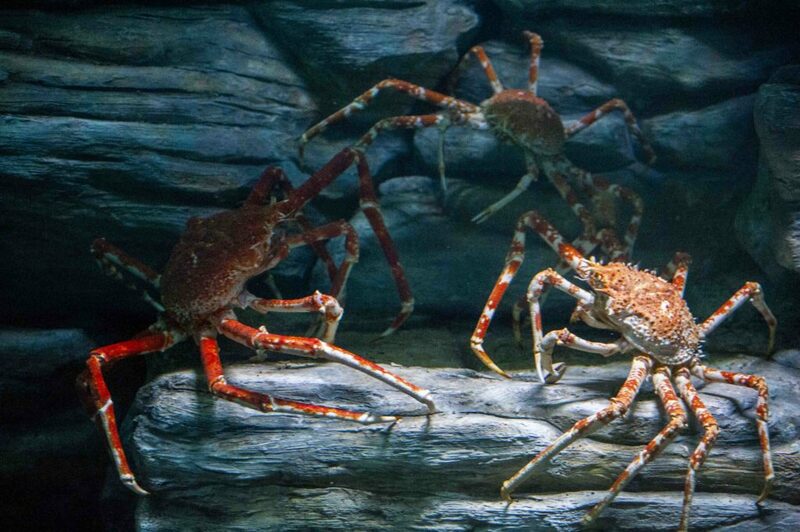 Point Defiance Zoo and Aquarium’s Japanese spider crabs are part of it. Hemolymph from each crab will be sent to Griffioen to be analyzed for hemocyte counts (similar to white and red blood cell counts in other animals); for glucose, calcium, sodium, potassium and other elements; and for the presence of heavy metals such as lead and mercury. The data will be combined with results from 25 crabs in six aquariums around the country to produce a set of baselines – what is a normal range and variation for the species. Intern veterinarian Dr. Kat Reed (left) and veterinarian Dr. Kadie Andersen examine a giant spider crab, assisted by aquarists. 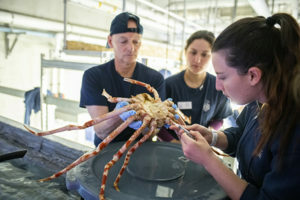 The data from this particular study will help anyone who provides care for giant spider crabs, but it could also be extrapolated to better understand other marine crustaceans, according to Griffioen. And because these enormous, sci-fi-looking animals are so long-lived (life expectancy can be up to 100 years in human care), the data becomes even more helpful. But the spider crabs at Point Defiance Zoo & Aquarium are blithely unaware of their contribution to science. Each one in turn is removed from the water, examined, hemolymph drawn, and then quickly – and gently – moved back to their home, long legs grasping the rock wall with ballet-style grace and ninja-like agility. Following the exams, Anderson said the crabs weighed from about 4 pounds to more than 8 pounds and varied in size. All appeared healthy and vigorous, she added.